Perfect solution for precise cuts. Does not require large space. Punching, flat shearing, angle shearing and notching options which does not require your best operator. Kingsland ironworkers are the No.1 established designer and manufacturer of top-quality universal steelworkers/ironworkers and punching machines. We also offer accessories and tooling. For over 60 years now, we have been innovating and specialising in hydraulic ironworkers. Discover our range here or contact us for more information. Universal and compact hydraulic steelworkers with 5 workstations developed for production purposes with maximum efficiency. On the cutting station, angle iron can be cut on every angle from 45º up to 90º, both internal and external, without any adaptations to the machine. Flanges from larger angle-iron can be mitre cut with the shear. Moreover, the machines are equipped with centralised pressure lubrication – being one feature of the low maintenance requirements. 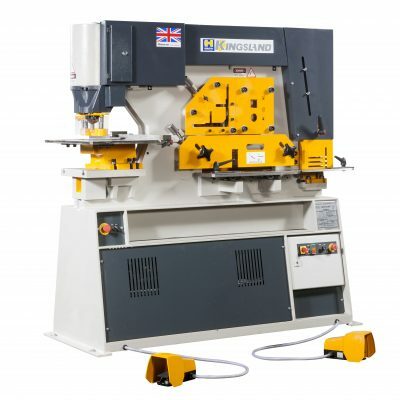 The universal steelworkjers are delivered with an extensive range of standard equipment, such as large heavy-duty tables on the punch-, shear-, and notching station. Easy adjustable holddowns to enable production in a safe and accurate way are fitted on every station. Free standing on suitable floor, they just need electrical connection to be ready to work. The universal steelworkers are delivered with an extensive range of standard equipment, such as large heavy-duty tables on the punch-, shear-, and notching station. Easy adjustable hold-downs to enable production in a safe and accurate way are fitted on every station. Free standing on suitable floor, they just need electrical connection to be ready to work. The MULTI range are universal two cylinder hydraulic steelworkers. Equipped with five workstations for 2 operators, developed for maximum production purposes and efficiency, as a result of years of continuous improvement and innovation.